Windows 8 looks like it will have a lot of business from the market as both Dell and HP have previously revealed they plan to release tablets for the business and market running purposes on Windows 8. The wall street journal reports that Lenovo will also offer a tablet in their ThinkPad lineup that will use Windows 8 for business purposes. Peter Hortensius, president of Lenovo’s product group, said, "We’re seeing a lot of enterprise users carry a tablet, a phone and a notebook. And there isn’t a good reason for why they should have to carry all three." The design of the Lenovo Windows 8 business tablet will likely be similar to the previously announced IdeaPad Yoga tablet, which was first revealed at CES 2012. The Yoga Tablet was a notebook/tablet hybrid with a screen designed to be used as a regular notebook which could then swivel around so you can use it as a rather large touch screen tablet. 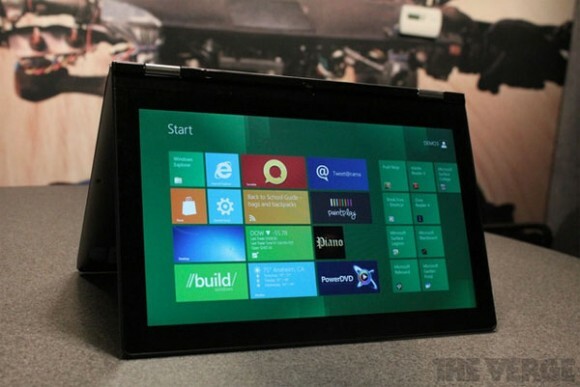 Hortensius said that Lenovo's business concentrated Windows 8 tablet will be released sometime in the next year. Details about the device are scarce but Hortensius did say that companies that offer the tablet will be able to control how their employees use it. He states, "I might not have a problem with an employee downloading Angry Birds, but I might not want him to download other things. That’s a feature you often find on notebooks but you don’t see on tablets."